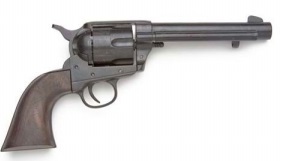 1873 Peacemaker western cowboy Cap Guns. Remember the Cap guns when you were a kid. 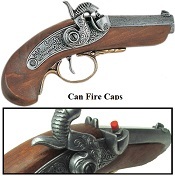 Here is a quality replica western display, costume or theatrical gun that also fires caps. Hard to see in the video but it smokes a little. Scroll down to view our selection and turn on your speakers and watch the video. CLICK THE ARROW TO WATCH THE VIDEO!! Refresh your browser to watch it again. Model 1873 WESTERN ARMY MODEL - ANTIQUE GRAY: This single action fast draw model features a 5.5" barrel, wood grips, working single action and shell ejector. It is available in 3 finishes: antique gun metal, finish with a simulated brass receiver. Length: 11", Weight: 1.8 lbs.